As per IRS rules and regulations, to take a charitable deduction from your tax liability for Cemetery Property that you purchased, inherited, received and/or responsible for, when you have given it to a LEGAL CHARITY, requires a CERTIFIED APPRAISAL by the IRS, for any donation over $5000 in value/deduction along with a SIGNED 8283 IRS form. Also, the IRS requires you to have Form 8283 completed and signed by the Appraiser, Yourself, and the entity the property was donated to. We complete the 8283 Form and attach to it an Appraisal that can justify a price of value to be used for the deduction. This can be worth thousands of $$$ applied as a credit to your tax liability. 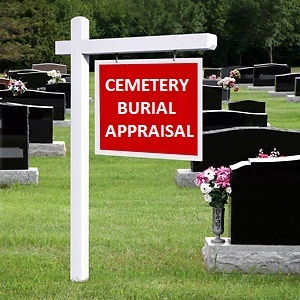 The Appraiser has been in the Cemetery industry for over 35 years and is active regularly performing appraisals for these individual donations, for Corporations seeking a valuation, and many other activities sought within the Funeral and Cemetery Industry. Ask for a background resume for the Appraiser. WHAT IT DOES COST ME? Cost is a fixed fee, and is not determined by the amount of the deduction, or the number of Cemetery plots, Mausoleum Crypts, Cremation niches, and any other Cemetery product. Please call us at 1-800-550-6325 for the current rates and schedules. We do handle Rush requests. DO YOU WANT MORE INFORMATION OR STILL HAVE QUESTIONS? EMAIL US AND REQUEST: 1. BACKGROUND REPORT OF APPRAISER 2. APPRAISAL CHECKLIST OF REQUIRED ITEMS. 3. HAVE A QUESTION? 4. PRODUCT QUESTIONS? Do You Have Unwanted or Unneeded Cemetery Property you want to sell??? If so, contact the pre-owned resale specialists at Nationwide Cemetery Sales Information. We can help you realize cash for that unwanted property!